← Who knows best ?? Delightfully detailed business planning CC, but with a few obvious potential issues. Rather than sourcing from the home market, obtaining low cost supplies of blue cheese from a southern european country with the skills and heritage associated with fine cheese making, will undoubtedly help to keep costs down for the staff, although with the ever present risk that the country might be on the verge of bankruptcy, and workers on short time, there could well be some considerable degree of uncertainty in the efficacy of the supply chain. 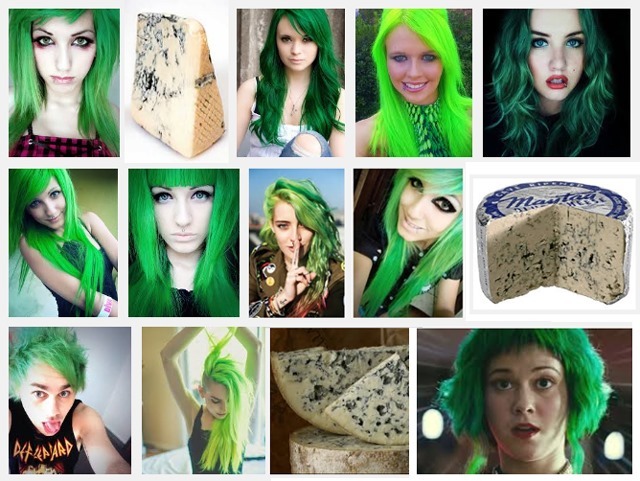 Fortunately, green hair dye is famously produced in a low labour cost far eastern country, where enormous shipments can be landed at the docks in a matter of weeks (typhoons permitting), and at market beating prices. The rumoured issue with apparent colour fading after a single wash shouldn’t be a problem as long as the staff desist from ablutions for a reasonable period between applications. I do think you should insist though that all hair styles be gently feathered towards the neckline, as graduate styles are simply all the rage these days. How strange to consider that so many students who prefer to enrol in the University of Life, will never graduate with a degree, but they will have meaningful, valued and fulfilling 1st Class careers, that are noted for distinction. Almost lunchtime, now where did I put those crackers …..?